R otaract is Rotary International’s service club for young people ages 18 to 30 in universities and communities. 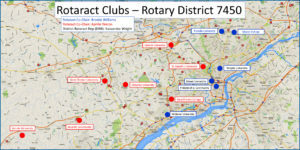 Interact clubs are sponsored by individual Rotary clubs, which provide support and guidance. They they are self-governing and self-supporting. Rotaract members develop leadership and professional skills, build relationships, and have fun. Rotaract members work closely with their local Rotary clubs and may also join Rotary at any time. Error: Error validating access token: Session has expired on Friday, 01-Mar-19 13:00:41 PST. The current time is Wednesday, 24-Apr-19 21:48:14 PDT.